The effect of the illicit narcotics trade in Colombia cannot be underestimated. Colombia continues to be the world's leading supplier of cocaine and most recently a significant supplier of marijuana and heroin. 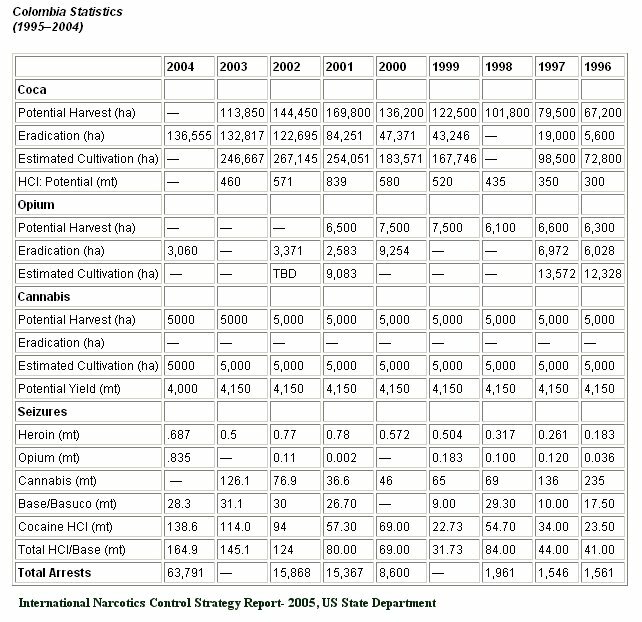 While the current cartels have not resorted to urban terrorism in the way the Medellin Cartel did under Pablo Escobar in the late 1980s and early 1990s, they have nonetheless excluded the government from large regions of the country in order to secure both areas for growing coca and poppy and trafficking routes to get their product to markets in the US and Europe. On the environmental side, the uncontrolled use of fragile tropical and jungle ecosystems to grow coca has caused considerable harm, as has the indiscriminate use of chemicals and fertilisers. The commercial worth of the illicit narcotics trade has been difficult to gauge with any precision but is thought to be approximately 5-10% of GDP. Nevertheless, its effect on the economy has been great with money laundering and contraband goods reducing the effectiveness of macroeconomic controls and distorting the consumer market. Colombia is the source of over 90 percent of the cocaine and 50 percent of the heroin entering the U.S. It is also a leading user of precursor chemicals and the focus of significant money laundering activity. Developed infrastructure like ports on both the Pacific and the Atlantic and the Pan American Highway, provide the narcotics terrorists with many options. The normal problems associated with the narcotics trafficking are compounded in Colombia by the presence of various illegal armed groups that are fighting with the government and involved in narcotics trafficking. Colombia's history of violence and insecurity has led to considerable international concern over the protection of human rights in that country. An office of the UN High Commissioner for Human Rights began working in Bogota in April 1997. The major source of human rights abuses in Colombia has been the internal armed conflict between the Colombian army, paramilitaries and the guerilla. Massacres, extrajudicial execution, murder, torture, forced disappearance and kidnapping, threats and forced displacement are common. However the armed conflict is not the only cause of human rights violations and violations of the right to life, due process and freedom of opinion, association and assembly also occur. The peace process did not result in any improvement in the human rights situation in Colombia, as both paramilitary and guerilla groups continued to engage in extrajudicial punishment and execution. Some action has been taken by the government to protect human rights workers, including the provision of increased hardware (eg bullet-proof vests) for activists and the removal of police and military officials on suspicion of collaboration with perpetrators. The Government is also making an effort to reduce human rights abuses by the Colombian military. The escalation of fighting is encouraging internal displacement as well as a flow of migrants and refugees to neighbouring countries. Higher numbers of affluent, well-educated Colombians are also now leaving the country.